On our way, waiting to be taken back, asleep before heading to the OR, finally home! I honestly can't remember if I blogged about the two surgeries Will had earlier this month. I know I mentioned them on the blog FB page, twitter, and instagram but I think I may have forgotten to actually blog about it. 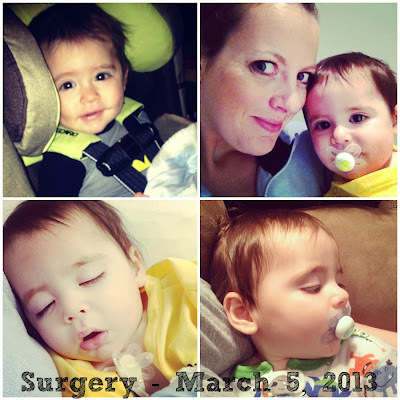 Will had two surgeries on March 5. He was in the OR for about 2 hours and immediately after surgery, we thought all was well. He woke up happy, waving and smiling at everyone in the PACU. Unfortunately, one surgery (his bone marrow biopsy) was not successful, and the other surgery (that we are not openly discussing for privacy reasons) led to some post surgery/ recovery issues. Thankfully, as of now, Will is finally healing and it looks like surgery #2 will end up ok, despite several setbacks and scares. However, surgery #1, the bone marrow biopsy, has to be redone. In basic terms, a baby's bones are incredibly soft when born and harden as the get older. This can lead to challenges when obtaining an adequate sample of bone marrow during a biopsy. The marrow is squishy/ sponge like and when a doctor is doing a biopsy on a patient with harder bones, it is very easy to tell when the biopsy probe/ needle reaches the marrow (bone marrow biopsies are done by "feel" not by sight). Unfortunately, Will's bones were still pretty squishy and it was nearly impossible for the surgeon to know when the bone stopped and the marrow begun. The sample that was taken was predonminately made up of actually bone and not a marrow. We are hoping his bones have hardened up a bit more in the past month and are praying a proper sample taken for biopsy next week! As of now we do not have an official surgery time. Will has an appointment on the BMT floor at 8:30am for blood counts and a possible platelet transfusion. If he needs platelets, he will receive them before the biopsy. If he doesn't, we will head to the outpatient surgery floor as soon as his counts are back. I'm mentally preparing myself for a long day at the hospital since we won't have an official surgery time until the morning of. I am also preparing for an extremely unhappy baby as Will wont' be able to eat/ drink from midnight until after surgery. We would appreciate thoughts and prayers as Will deals with another surgery. Hopefully this will be his second to last time in the OR before starting chemo. His next surgery will be his central line placement a few days before admission/ chemo begins. If you want relatively live updates on Tuesday, you will be able to find them on twitter or the blog FB page! I am constantly praying for you all. I will hold Will in my heart especially as your approach this next surgery! What a strong baby boy you have!!! Praying for you all!!! My prayers are with Will and your family today. 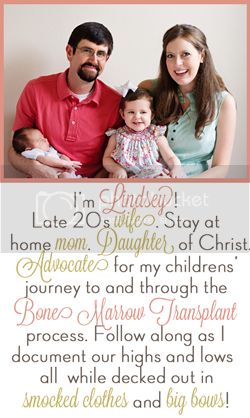 I hope that they are able to get the biopsy that they need.